The below information comes courtesy of the excellent website http://www.ozatwar.com by Peter Dunn, and was provided by Noel Brettoner who spent countless hours researching the history of the airfield and Captain McIntyre. Our sincere thanks go out to both people for permission to reproduce that information here. "McIntyre Field" was established by the USAAF on the NSW/Victoria border, near the Newell Highway. It originally covered an area of about 25 miles square. The RAAF took over the operation of the airfield in 1942 and named it Tocumwal. Up to 4,500 RAAF personnel, and 400 WAAAF personnel were based at Tocumwal.Tocumwal was home to up to 54 Liberators, 11 Vultee Vengeance, 5 Kittyhawks and an Airspeed Oxford. It was also a vast storage and repair depot with aircraft such as Avro Anson, Airacobra, Beaufort, Boeing, Boomerang, Dakota, Hudson, Lancaster, Lincoln, Meteor, Mosquito, Mustang, Spitfire, Beaufighter, Vampire, Winjeel and Wirraway.After the RAAF left Tocumwal in 1960, over 700 aircraft were scrapped through until 1963.Six 39.6 metre timber long span truss roof aircraft hangars. These were the first long span trusses built using timber as tension web members and they remain as the longest clear span triangular timber truss buildings known in Australia. Two similar 29.3 metre hangars were built at Tocumwal. Three of the original hangars can still be seen at Tocumwal. A unknown US bomber crashed possibly in the Archerfield - Brisbane area on 5 June 1942 killing all those on board. This is the list, though not 100% confirmed. Captain McIntyre, Patrick W. O-21495 Pilot, Air Corps, HQ 19th Bomber Group Heavy, Fatal. Second Lieutenant Muckley, Dwight S, Jr., O-398662, Air Corps, 34 Pursuit Squadron?, Fatal. First Lieutenant Phipps, Tilden. E. Jr., O-355533, Medical Corps, Fatal. Captain Cone, Richard M., O-250706, 42nd Chemical Laboratory Company, Fatal. Lysakoski, Henry W., Civilian, Glen Martin Aircraft Company, Fatal. Marschmer, Edward, Civilian, Glen Martin Aircraft Company, Fatal. Second Lieutenant Parker, James W., O-385535, Chemical Warfare Service, survived initial crash but subsequently died of wounds on 8 June 1942. Captain McIntyre, Captain Cone and Mr Lysakoski were re-buried at the Honolulu Memorial, Hawaii. A First Lieutenant Phipps, Tilden. H. Jr. was buried at the Memorial Cemetery, Oklahoma. Note that although the middle initial is different the date of death is the same - 5 June 1942. Also the Phipps buried at Ipswich US Military Cemetery was a 'H'. It is assumed that there was a mix-up regarding the middle name and that this is the same Phipps that was in the crash on 5 June 1942. These records show him as 'Medical Corps' which is interesting as other records show him as being Air Corps. "On May 5, 1942, Muckley, three officers and two civilians were killed "in an airplane accident somewhere in the Far Eastern theater" according to his report of death. The author found that he was killed in a plane crash in Australia, but was unable to determine the crash location. He was initially buried in the American section of Ipswich Cemetery, Brisbane, Australia (Section 1, Block 3, Letter A) on May 9, 1942. Muckley was subsequently reburied in section 12, grave 1776 in Arlington National Cemetery. He was posthumously awarded the Distinguished Flying Cross for his actions on February 7, 1942." It is interesting to note that the above Arlington National Cemetery web site information gives Muckley's date of death as 5 May 1942 and not 5 June 1942 and his burial date as 9 May 1942. The official document below clearly shows Muckley's date of death as 5 June 1942. The Ipswich City Council Cemetery Records show them dying on 5 June 42. Another possibility for the date mix-up could be that they were killed in May and buried at the Lutwyche Military Cemetery in Brisbane and then reburied at Ipswich US Military Cemetery in June. For example Captain Baron Brodine was killed in a crash at Dinmore on 20 February 1942, and was buried at Lutwyche on 21 February but was then removed from Lutwyche and reburied at Ipswich US Military Cemetery on 25 June 1942. The Americans only used Lutwyche Cemetery for a short while until the Ipswich US Military Cemetery was available. Another possibility with the difference in the dates could be the confusion caused by the different way Americans and Australians show calendar dates. For example Australians would show 5 June 1942 as 5/6/42 whereas Americans would show 5 June 1942 as 6/5/42. 2nd Lt Dwight Muckley ASN#O-398662 was a member of the 34th Pursuit Squadron, 35th Pursuit Group in the Philippines and because he was a pilot without an aircraft, he was evacuated to Australia in late December 1941/early January 1942. Originally he was in the 20th Pursuit Squadron (Provisional). 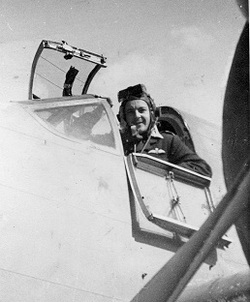 He left Amberley on the 29 January 1942. Due to the losses both in transit and on arrival, the unit was absorbed by the 17th Pursuit Squadron (Provisional) to make up for their own losses. He became a highly respected member of the 17th Pursuit Squadron (Provisional) in Java. He was awarded one of the seven Distinguish Flying Cross’s to be issued to that Unit in that short and violent campaign. Ironically he was again evacuated back from the war zone to Australia on the 3 March 1942 by 7th /19th Bomb Group B-17E Flying Fortress via Broome/Pearce. Muckley's Distinguished Flying Cross was awarded posthumously to recognise an incident where Second Lieutenant Muckley and his wingman had attacked a flight of eight Japanese fighters on 7 February 1942 over Bali, Dutch East Indies. Muckley became separated from his wingman during the dogfight. Muckley subsequently noticed that his wingman was being attacked by the Japanese, so he broke off his attack on the Japanese formation and returned to defend his wingman. Muckley's aircraft was heavily damaged in the dogfight, but he was able to land safely. 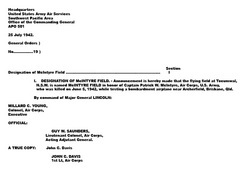 Second Lieutenant Muckley was initially buried in the American section of Ipswich US Military Cemetery, Ipswich, Australia (Section 1, Block 3, Letter A) on 9 June 1942. Muckley was subsequently reburied in Section 12, Grave 1776 in Arlington National Cemetery. He was posthumously awarded the Distinguished Flying Cross for his actions on 7 February 1942. Camp Muckley, a US Military Camp near Archerfield Airfield in Brisbane was named after Second Lieutenant Dwight S. Muckley, Jr. The Pilot of the aircraft was Lt. Patrick W. McIntyre (0-21495) and his co-pilot was 2nd Lt Dwight Summer Muckley Jnr. (0- 398662). Also on board was a doctor and two representatives from Glenn Martin aviation. There was also two army chemical warfare staff. One of these two personnel apparently lived for a while and died the next day. Captain Richard Morton Cone, 0250706, of NY, USA was from the 42nd Chemical Laboratory Company (42nd CML Lab Co.). In December 1942, the 42nd Chemical Laboratory Co. was based at Clayfield in Brisbane under the command of Captain H.W. Hillis. Captain Cone and 2nd Lt. Parker were carrying out experiments to determine whether incendiary bombs could be improvised from training bombs, using gasoline thickened with crude rubber as a filling. No record can be found on this crash. It is believed that McIntyre was from HQ Squadron of the 19th Bomb Group, so was the aircraft a B-17 Flying Fortress perhaps. A72-4 was operational in time for No.1 Liberator Course which commenced in April 1944. The log book of Keith Crisp (gunner) shows eleven flights in A72-7 and A72-8 between 17 April and 26 April - familiarization flying in the Tocumwal area - before a one hour flight in A72-4 on 28 April. In late August or early September, A72-4 was taxying for a test flight when a strong smell of petrol was noted by Ron Sawyer, an electrician who often flew when a flight engineer was not available. He was also an instructor on the electrical equipment on the aircraft (voltage regulator operation etc). He went aft and discovered a bad leak in a wing tank. The aircraft was listed U/S immediately, and was placed in Hangar 2 for repairs. A72-1 was in the hangar at the back, also unserviceable. On 7 September five of the B-24Ds were discovered to have been sabotaged with the wiring cut behind the instrument panels, probably with a large pair of tin snips. A twelve day investigation was unable to pinpoint the culprit. A72-4 and A72-1 were two of the aircraft damaged. The wire cutting was repeated post-war at Amberley on the Avro Lincolns of 82 Wing RAAF. This time the culprit, a Leading Aircraftsman fitter 2A, was caught and court martialled. Repairs to A72-4 were carried out, and on the evening of 2 October 1944 the aircraft was undergoing final engineering tests prior to flight tests next day. George Hall was Duty Sergeant that night, and was outside the hangar watching the undercarriage retraction tests at around 20.00 or 21.00. Hall had arrived at Tocumwal just prior to the sabotage, but, because of a shortage of aircraft, his course was unable to fly as scheduled. Course members were assigned ground duties, which accounted for George being Duty Sergeant that night. He saw a flash, then a fire in the bomb bay. Flight Sergeant Jock Main was in charge of the electrical repairs, and had switched on the auxiliary hydraulic pumps which were located near the front of the bomb bay on the starboard side. A short at the switch ignited the fuel/air mixture in the bomb bay which had accumulated from the leaking tank. Although he was burned in the fire, Jock’s biggest complaint was that he had to sign his name 27 times on the paperwork explaining the accident! Tocumwal hangars were built of wood, and attached to hangar No.2 was a paint store which exploded and added to the conflagration. An Oxford and a Vengeance, the latter usually flown by Wing Commander Brian (Black Jack) Walker, CO of 5 OTU, also at Tocumwal, were parked at the front of the hangar and were pushed clear. A72-10 was slightly damaged while being pushed a little too enthusiastically by the volunteers who rushed from all over the base to help. We had just started the flying part of the course and four of our crews were driven by bus to the Chief Flying Instructor to pick up our Libs and orders when the news erupted. All the wiring of some Libs had been deliberately cut. We were the first crew scheduled to fly that morning; nobody knew if any other sabotage had been carried out, so we were told, "Up you go." If we had no trouble then the other three crews would follow us up. "Shits were trumps" that morning. 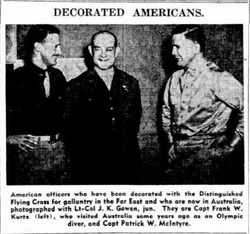 Members of No.4 Liberator Course had completed training and were having their "send off" in the Sergeant's Mess when, about 21.30, they noticed a glow across the "prairie" and knew it was a fire in a hangar. 24 inebriated 19-year old gunners piled into the backs of trucks, carrying plates of savouries, sandwiches and jugs of beer. A fire was not going to spoil their send off. They were the first to arrive, pulling clear a Vengeance and two other light aircraft. The rest of us dived into the hangar salvaging hand tools from the stores sections. I was second last out of the fire and smoke after about 30 minutes - the SPs and Fire Brigade had arrived and took over outside. They had our fellows in a bunch and grabbed me and said, "That's it, it's too dangerous to go in again." I said, "Like hell, my mate's still in there." They let me go and in I went looking for Sgt Jack Daly. I found him in between the two burning Libs busting his guts pulling a mobile battery charger. So Jack and I and the battery charger were the last out. They pulled the galvanised iron wall off the side of the hangar and rescued hand tools until the SPs ordered them out, whereupon they returned to the Mess, demanded the bar be re-opened, and finished the party. On parade the next morning the CO berated them for lack of discipline during the course and then, surprisingly, complimented them on their efforts the night before. Inside my shirt that night were all the tools I needed for my turret, and years later, the ratchet broke on my screwdriver. I still have that screwdriver today, minus the ratchet. All that was left the next day was smouldering wreckage and barely enough of A72-1 and A72-4 to recognise. The remains went to 7CRD on 10 October for conversion to components. Subsequent rumour had the ignition the result of further sabotage – a detonator placed across the contacts of the undercarriage solenoid which exploded when the undercarriage switch was activated. 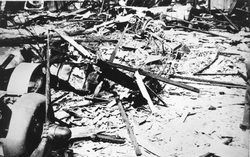 Security was tightened after the sabotage, and more guards were on duty. Civilians had become used to using portions of Tocumwal base as a short cut, and George Hall challenged a bicycle rider who ignored the call. George raised his .303 rifle and fired a warning shot over the cyclist’s head; the cyclist stopped so fast he went over the handlebars “and made a mess of himself on the bitumen”. BRIEF HISTORY OF TOCUMWAL AERODROME. 4 runways up to 1,850 metres in length, 112 kms of roadways and taxiways, 6.4 kms of branch railway line to a new rail platform on the field, 7 giant hangars to house the big Liberator bombers, 600 other buildings for hangars, workshops, mess halls, sleeping quarters, administration and a 200 bed hospital. In just 16 weeks, after expenditure of A$6 million, they built, in Tocumwal, the largest aerodrome in the southern hemisphere. of 7,000 American personnel, a major presence in Tocumwal. AUSTRALIAN OCCUPATION Tocumwal Aerodrome had gone through a frantic construction stage one, a brief American occupation stage two, and in November 1942, it entered its main stage three, with the RAAF taking it over as a giant multi-function depot for aircraft repair and maintenance and training base for recruits, bomber aircrews and paratroopers. All types of aircraft came in - battered planes from combat zones for urgent repair, new planes ferried in from overseas to be serviced, modified, armed and made fully operational. 54 of the big Liberator bombers were stationed at Tocumwal and they turned out new eleven man crews every eight weeks. Local residents watched the Liberators in mock battles with Kittyhawk fighters, or in gunnery practice with Vultee Vengeances towing drogue targets, and paratroopers jumping from Dakota aircraft. Accidents were inevitable and the Tocumwal Services Cemetery marks the graves of many young men and women who died in training. At its peak in 1944/45, there were 5,000 RAAF personnel on the base, including 400 WAAAF’s, these young girls fulfilling a vital role in the running of the air force. The impact upon the small township of Tocumwal was enormous - the shops and cafes and pubs were inundated. Church congregations swelled to capacity, romances led to weddings. There was entertainment in homes, cinemas and dance halls and cricket, football, tennis and swimming at our famous beaches were all popular forms of recreation. Touring entertainers gave concerts in the giant hangars, even Gracie Fields came to Tocumwal for a sell out performance. leaving a huge void in Tocumwal. RECOLLECTIONS OF THE WAR YEARS. Trooper Eric Johnson, 20 years of age. The Services section is on the right-hand side at the cemetery entrance. Perhaps if you visit Tocumwal, you may pause for a minute, before the rows of graves and headstones of the young service men and women who came to Tocumwal in wartime, but never left. in Canberra where they are now heritage listed by the National Trust. Tocumwal Aerodrome today, a testament to a tragedy of destruction. Just a few years ago the Tocumwal Aerodrome did not have any recorded history. TOCUMWAL HISTORIC AERODROME MUSEUM group and wrote to scores of ex RAAF personnel asking for any wartime material that they might still have. As a result, in came hundreds of old Box-Brownie snaps, faded and cracked and notes of memories of time spent at Tocumwal. These have been enlarged, reprinted and assembled into a remarkable photographic display now to be seen in the Museum section of the Tocumwal Information Centre. all enhance the rich history of the aerodrome . the presence of this once mighty aircraft in the small country town of Tocumwal. DOES TRAGEDY LOOM ONCE AGAIN? the level of maintenance will inevitably decline, putting the wartime structure at serious risk. The large Tocumwal hangars, 100mx50m, are significant historical buildings, being the largest clear-span timber buildings in Australia. They introduced a unique structural technology, employing shear connectors and steel plate joints , enabling the innovative use of green Australian hardwoods in their urgent wartime construction in 1942.
country faced and overcame. The remaining Tocumwal Hangars are just such icons. the Americans named it “McIntyre Field”. why the Americans so named it. The generally accepted theory was that it was named after Flight Lieutenant Ivor McIntyre, Royal Australian Air Force, who in 1924 with Wing Commander S. J. Goble, first circumnavigated Australia in a flight which took 43 days to complete. and the American “McIntyre Field” at Tocumwal. a bombardment airplane near Archerfield, Brisbane, Qld. OFFICIAL: MILLARD C. YOUNG, Colonel Air Corps Executive. OFFICIAL: GUY W. SAUNDERS, Lt-Colonel Air Corps, Acting Adjutant General. Signed a True Copy: JOHN C. DAVIS, 1st Lt. Air Corps. the golf links.There usually was a wait.The crew headed for the pub shortly after landing.To steady their nerves they told us.In the 1940's I got to understand that. thing' and I had my first and only driving lesson. I went in on 11.11.40,Armistice Day for The War To End All Wars to the calls of 'you'll be sorry' from 7 Course ahead of us at Bradfield,a Sydney suburb,RAAF number 402895. Then it was Initial Training,Tamworth on Tigers,Amberley on lumbering Ansons,back to Bradfield and on 3.9.41 off to the Middle east on the Queen Mary,now as a pilot officer and a qualified pilot.Revenge was sweet.The drill instructor,Sgt.Bully,yes that was his name,who had given me a hard time,told me I'd not make pilot,had to salute me. us,appetites sharpened by the salt air,were served by many stewards.Below hundreds of Army guys were hoping to die. junior pilot officer? Why not.Called a meeting of the NCO's who really ran the show and off we went until their officers showed up. Palestine to Damascus in Syria,road to Habbaniya 50 miles west of Baghdad where we were to pick up Blenheims and take them to 244.They weren't ready,Communications Flight was short of pilots,they put us to work flying their antiquated machines,all they could get,a wonderful experience for me. dreadful aeroplane.' After we left 244 there were 32 Bisley crashes in two years. After Alamein in Egypt the Army was chasing the Germans west before giving them the Big A out of North Africa.Would we not take the six months break instructing in between Squadrons they asked. Dad had advised me never to volunteer,but then I'd not always taken his advice.Four days after we left Sharjah I was flying Baltimores with 203 Squadron in Egypt.We followed the 8th Army to Benghazi and began roaming the Mediterranean,the southern Adriatic and the Aegean amongst the German-held Greek islands at 150 feet and 250 mph. One plane so the flak from a hundred or so guns enemy was all ours,with Bill or Bob in the top turret banging back with our twin .5's,a bit like farting at thunder.Exciting times. All good things come to an end.On 24.9.42 ,on a trip into the Aegean past eight Greek islands where we had the heaviest flak we'd experienced,after a 6 1/2 hour flight,called to the CO's office he told us we were off ops,that we'd done far more than our share.We didn't argue.By staying alive I was now a Flight Lieutenant.I ferried aircraft for a while then on 28.11.43 moved to 70 OTU in Egypt to cart trainee gunners around.One nearly shot the rudder off,just another brush with death,one of many. down.It,I discovered,was in now Zimababwe. and the gunners on 29.3 44. Then in August,what I'd been waiting for.YOU'RE GOING HOME. 4.8.44 embarked on an slow old Dutch ship and on 10.9.44 got off in Sydney.How wonderful that was.Leave,had a spell in hospital,on 1.12.44 off to 7 OTU at Tocumwal to use my flying instructors course to teach others to fly Liberators. My first Lib flight,two hours, was on December 15 with instructor F/Lt Gibbons doing circuits and bumps. The Baltimores,twin engined,much smaller than a Lib had 3600 horsepower.The much bigger four engined Libs had only 5000 and consequently were much less nippy than the Balts.Heavier on the controls too.However,on longer trips we did later,the Libs were more comfortable.The Balts had a suitcase-shaped fuselage and a fighter-sized cockpit.Once strapped in I was there for up to nearly seven hours on some flights.Only way I could relieve the bum numbness was,if high enough,trim the plane to fly straight and level,let go of the controls,grasp the hatch above my head and lift off the seat.In the Libs there was room to walk around.The Libs had an auto pilot and a radio direction-finder I could lock onto a known radio station and sit back and listen to whatever music was playing,letting the Lib fly itself.Even have a cuppa. The Libs were a well built airplane,sluggish but pleasant to fly and the motors reliable. instructor by day.Night was to come. stood with the usual cluster at its door.We waited and finally decided to walk in lumping our gear.As I passed the bus I gave her a big glare. Parachute returned,I jumped on my bike and headed for my room.The bus followed me,she got out to apologise,hadn't seen me come in.There would be no better time,I asked her out and began a love affair that lasted until her death 61 years later. pupil for I had no idea how good or bad he was.I'd hold the four throttles open and call the airspeed to him.It seemed to stick at 80 knots,the end of the strip was coming up fast,we were below takeoff speed,I can still see the red light on a building near the strip's end getting bigger and bigger.Somehow we always made it. Then there was the night,it was closed camp,nobody allowed out, that a pupil came in too low,took his brakelines off on a treetop,landed on a strip pointing right into the centre of the camp,no brakes,the only thing that saved mass deaths was a gully that stopped the Lib short of the huts. Murray instead of the strip.An exciting life while it lasted. answer out of the night,ANYONE. The war was now going in our favour but there was still much to do in Europe and the Japs to finish off.We kept busy by night and day.My log book shows I was teaching pilots from Flight Sergeant to Wing Commander the mysteries of the Liberator,even did a special flight for Fox Movietone including mock attacks by a Kittihawk fighter group.Sometimes we landed at Ballarat,overnighted,even at Laverton On March 23 off we went to Sydney on a V Loan Flyover,massed Liberators,me sitting back listening to the music of a Sydney radio station,the radio direction finder tuned to it,the auto pilot flying the machine.Wow,what a way to fight a war. We'd managed leave together,gone to Melbourne,I'd met Kath's parents,we'd become engaged.Which,at Toc,brought up a problem.Bad for discipline Old Boy to have a WAAF and a Flight Lieut walk out of the gate arm in arm.Behind a building,screened by shrubbery,there was a big hole in the fence everybody used.We could have used that too but I said 'bugger it.Not my style' and went to the CO and got a chit to say it was ok for us to walk out together.He did have rather a sloppy grin on his dial as he signed it. How disappointing,we were never challenged at the guardpost. I have always wondered,was this the reason for what followed or was the CO being compassionate. altitudes,using radar to aim,unload them on a poor defenceless rock,of course photographing the strikes to see how accurate radar bombing was. Hmmm.How often do you get 10,000 feet clear visibility in Bass Strait in mid winter? We'd married,had found a small flat which thanks to Kath's brother we'd nearly been booted out of.He was a policeman.Walking back to the flat, a police car suddenly screeched to a stop beside us,two cops jumped out,laughing their damned heads off,grabbed us,away we went to the flat with the siren going.That took some explaining to the landlady.The lovely RAAF allowed me to live out,collected me in the morning,brought me home. I'd be taken to my Lib,fire it up,trundle down to the rock,find the area socked in with cloud,unable to photo the strikes,be back in the flat for lunch and cuddles. What a way to fight a war. All shipping had been warned to keep clear of the rock.Approaching it we'd be ready for the first drop.One morning,a couple of miles away,a fishing boat was heading towards it.Will we drop the bomb aimer asked.He'd consistently lobbed them close so I replied yes,we'll give them a fright.It was a beautiful day,no wind,sea like glass.The boat showed little wake.No doubt the crew were enjoying the unusual conditions,relaxed.The Lib had a catwalk to the rear gunner's position through the bomb bay.With the bomb doors open all you had below you was lots of space.There were rails.No way was I going to miss what was coming.Leaving the second pilot in charge I went and stood on the catwalk.Holding firmly onto the rails. A 250 pounder dropped past my shoulder,seeming to fall slowly,then speeding up as it neared the sea.It hit near the rock throwing up a huge spray.I could hear the explosion.Down there it must have been deafening.The boat? For moments,no action.Suddenly the wake boiled,it swung 180 degrees and fled for the horizon.Although it wasn't a planing hull I'm sure it was up on the plane. flown,singles,twins,fours,flying instructor on twins and fours.Since,six more ,ultralight ,amphibian, floatplane,glider.78 ops flights on two squadrons without taking the break in between.Left footprints in 18 different countries,flew over many where I didn't want to.Came out relatively undamaged.Anyone in 1943 when the flak was flying around me had told me I'd see 2011 I'd have told them they were effen mad. Tocumwal Historic Aerodrome Museum Website is up and running ! Well here we are at last ! This will hopefully be a spot where we can bring you up to date information, thoughts, etc etc. Keep and eye out over the coming months while we get everything set up.